Porcelain-Fused-to-Metal (PFM) crowns consist of a non-precious or precious alloy coping, with layered porcelain overlay, and are one of the most traditional types of crown and bridge restorations – tried and tested, in terms of strength, reliability and functionality. PFM crowns are a highly versatile option, and can be used for both anterior and posterior restorations of any size or length. All PFM crowns use dental alloys and the finest feldspathic porcelain systems to ensure aesthetically attractive, natural-looking results. 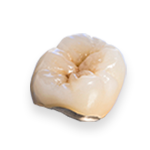 Non-precious PFM crowns have a cobalt chrome substructure, laminated with porcelain for aesthetics.